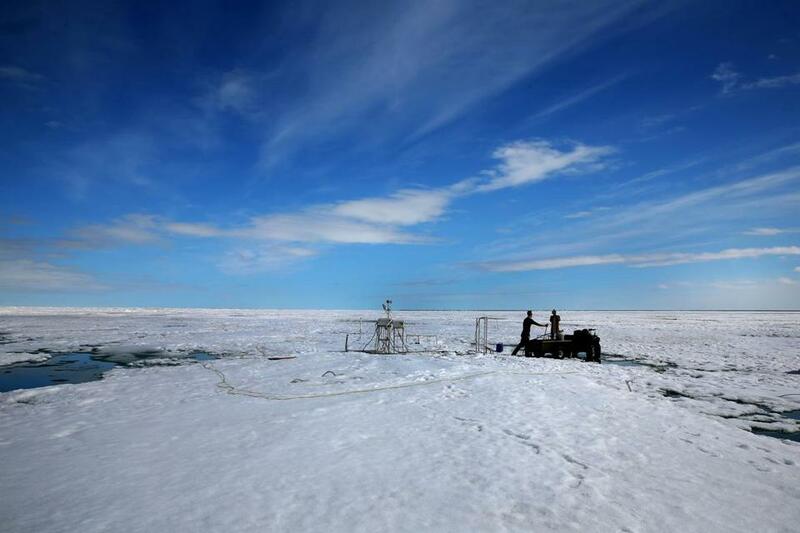 Researchers removed scientific equipment from sea ice near Barrow, Alaska. The extent of sea ice surrounding the Arctic and Antarctic regions are both at record lows for this time of year — marking the first time scientists have simultaneously tracked record low ice levels around each of the planet’s poles. Scientists say the below-normal sea ice extent — a rough measurement of the surface area of ice-covered ocean — in the Arctic is particularly worrisome because it is a strong indication of the effects of climate change. Experts said they were also shocked by the decrease in sea ice in the Antarctic, but were not as concerned by that development. In the Arctic, sea ice extent measured 8.625 million square kilometers, as of Nov. 20, according to data from the National Snow & Ice Data Center, which measures sea ice extent as areas of ocean being covered by at least 15 percent sea ice. The previous record low at that point in the year, based on satellite records dating back to 1979, was 9.632 million square kilometers in 2012. Around this time of year, the sea ice extent in the Arctic is normally increasing as wintry conditions start to set in. But in the last several days the seasonal growth of sea ice there hascome to a near halt due to above-normal temperatures there that experts said they believed to be caused by warmer-than-usual ocean temperatures left over from the summer and winds from the south driving warmer air into the region. Claire Parkinson, a climatologist at NASA’s Goddard Space Flight Center, said that above-average temperatures and below-normal sea ice extents in the Arctic, while concerning especially for the longterm, are not entirely surprising. “The Arctic has been decreasing for many years now in terms of overall trend,” she said. 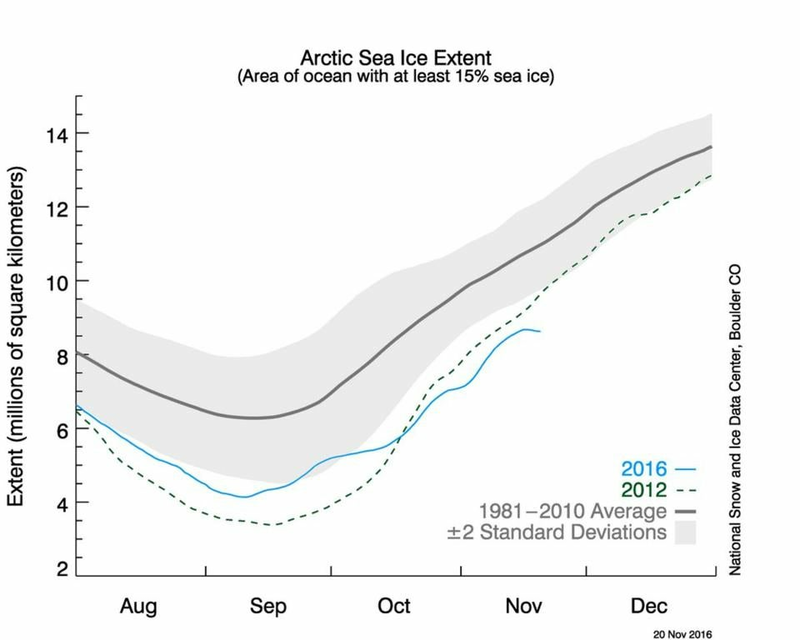 Since 1979, winter Arctic ice extent has decreased by about 3 percent per decade, records show. “The Arctic is kind of a nothing new here story — what’s going on now is extreme and a record low — but we’ve seen record lows in the past couple of decades,” said Walt Meier, a scientist from the Goddard center’s Cryospheric Sciences Laboratory. 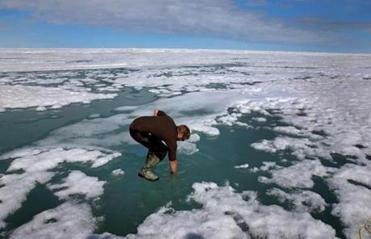 But “from a climate perspective, the Arctic changes are much more significant,” he said. The years of diminishing sea ice extent has been caused by temperature increases scientists have attributed to greenhouse gas emissions from humans. The shrinking sea ice extent is problematic because ice cover in the Earth’s cool polar regions — particularly the Arctic which maintains much more ice through the summer months — help moderate global temperatures. “It acts as a refrigerator or cooler for the planet, if you will,” Meier said. Sea ice has a bright surface that reflects about 80 percent of the sunlight that strikes it, helping to maintain cool temperatures. When that ice is lost, it exposes a dark ocean surface, which has the opposite effect absorbing about 90 percent of sunlight causing both sea and air temperatures to warm. Melting sea ice does not cause sea levels to rise — melting land ice causes that. But because melting sea ice leads to warmer temperatures, it indirectly contributes to sea level rise that’s threatening coastal communities around the planet. The sea ice extent in the Antarctic covered 13.616 million square kilometers, as of Nov. 20, data show. The previous record low sea ice extent at that point in the year was 14.7 million square kilometers in 1986. In the Antarctic, the sea ice extent there is normally shrinking around this time of year as summer starts to set in. But this year, the drop in sea ice coverage has been much more dramatic. “It’s been quite striking,” said Parkinson. The trend is also a remarkable reversal from what had been going on in the Antarctic. 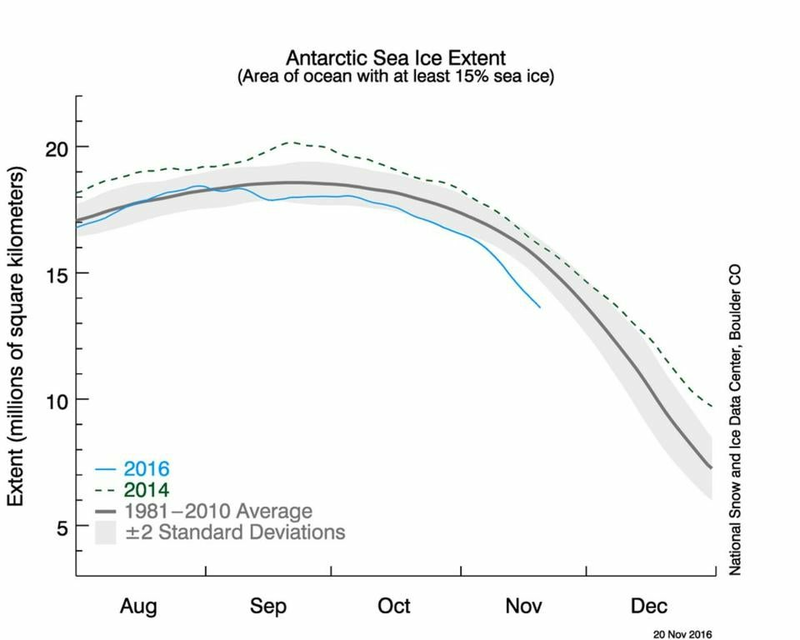 The sea ice extent in the Antarctic had actually risen in recent years, even hitting record highs in 2014. Something threw that trend off course recently. “It’s a little mysterious,” said Meier. Both he and Parkinson noted the Antarctic is much more prone to large swings in sea ice extent than the Arctic. And they said they suspected the sudden shift happening now is being caused primarily by weather conditions and patterns. It would be unlikely that a more worrisome potential cause — climate change — could explain all of the recent, sharp and sudden decline in Antarctic sea ice. But experts said they expect the Antarctic’s sea ice extent will eventually start to lose sea ice extent due to global warming, albeit more gradually. Even though sea ice extent had increased there in recent years, scientists believe that climate change has been affecting the Antarctic. But various factors in that region have managed to largely cancel out the warming, including the Antarctic’s geography, geometry, and wind and ocean currents that somewhat insulate the region to global weather patterns. “It’s expected that, eventually, warming will catch up and become a significant player in the Antarctic,” Meier said. Scientists also noted that losses in Arctic ice extent in recent years have far exceeded the gains in Antarctic ice extent. Does it matter that both poles are seeing historic lows in sea ice extent at the same time?